As a website owner, the last thing you can expect from your website is that it will get penalised by Google. A Google penalty will not just take away your site’s search engine rankings but also its traffic and the leads you are getting from it. It can be a major setback for your website and your business. Some of the key reasons why websites get penalised include thin content, poor quality backlinks and spammy SEO activities. As a marketer or a small business owner, you must ensure that you are optimising your website strictly according to search engine guidelines. Remember, an algorithm update and penalty are two different things altogether. An update can wipe out traffic for a significant number of sites in one go. A penalty, on the other hand, is applied manually to sites which are purposely doing black hat SEO activities to achieve more rankings. You must ensure that your team or your agency is adding only high quality and relevant content to the site. Build natural backlinks for your website and ensure these are coming from high domain authority and related sites. In case your site has been penalised by Google, you will receive a message in your Google Search Console account. You must not panic as you will get a chance to retrieve your rankings and traffic by resolving the relevant issues. You must quickly get the mentioned problems fixed, and submit a reconsideration request to Google. 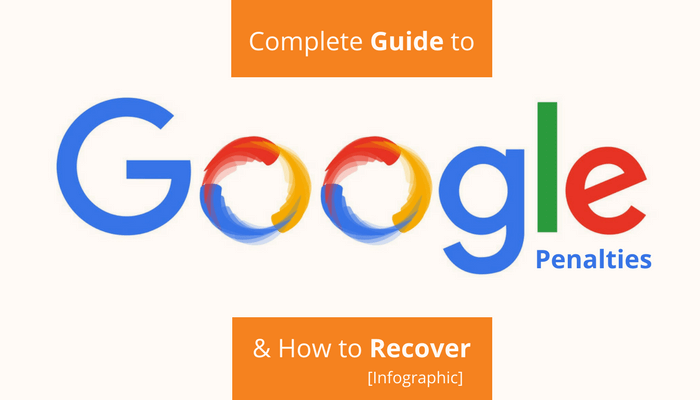 Here is an infographic that showcases the complete list of Google penalties and how you can recover from them.